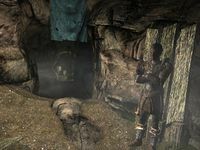 Cragslane Cavern is a small cave being used by bandits for skooma operations and animal blood sports. 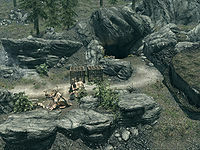 It is located north of Shor's Stone, west of Ansilvund, just off the road between Riften and Windhelm. There is a single Bouncer on guard outside the entrance, with two pit wolves in cages with leveled locks near him. There is a campfire in front with a cooking pot hanging over it and two small one-man tents containing unowned bed rolls beside the fire separated by a food barrel and a couple of sacks. East of the fire is a tanning rack. The entrance to the cavern is to the southwest of the campfire, with a crate and a couple of food sacks beside it. The entrance leads into a tunnel descending to the south. The bottom is lit by a lantern on a barrel to the left, with a bandit standing guard opposite--(see bugs). Beyond him the tunnel narrows, ahead is a mead barrel, where the tunnel turns to the west. After a few paces, it opens out into a large cave with a central pit containing two pit wolves with one pit wolf standing over the corpse of another. There are two gamblers standing near the pit. There are chairs spaced around the pit for the patrons to sit and watch the fights and a cart on the nearside containing a couple of pickaxes and shovels. In the northwest corner is the bar with a couple of stools in front and with a total of one bottle of alto wine, one bottle of wine, four bottles of ale and two bottles of Nord mead either on or under the counter along with two bottles of skooma, a bowl of moon sugar and a copy of the Lockpicking skill book The Wolf Queen, v1 under the counter. Behind the bar is an unarmed gambler and an armed barkeep standing behind it. The Barkeep carries the Craglane Chest Key which opens an apprentice locked chest behind the bar. There are also a couple of mead barrels in the corner and to the east of the bar an unowned single bed. To the south are two tunnels, one of which leads to and from the pit and the other in front of it. There is also a raised wooden structure with a ramp to the north leading down to the ground level. Under the wooden structure are several crates, barrels and sacks. The tunnel to the south leads to another chamber, where the leader of the bandits, the Butcher, stands facing away from you. In this cave there is an unowned bed roll against the east wall, while against the rear wall is a small raised area with a wooden ramp going up. There are a couple of food barrels and a basket containing green apples here, beside these is a small set of shelves holding four bottles of skooma, a blue dartwing and an expert locked strongbox. To the right of this is a long wooden table holding a small coin purse, three more bottles of skooma, two samples of fly amanita fungus, a bowl of moon sugar, a bottle of Nord mead and an iron dagger, with a bunch of dried elves ear and a bunch of dried frost mirriam hanging over the table. To the right of the table are more crates, sacks and barrels with a pickaxe and woodcutter's axe on top. In front of the wooden ramp is an apprentice locked chest with a bear trap in front of it. This chest is also opened with the Barkeep's key. Against the west wall are three cages, two of which are apprentice locked and contain pit wolves, while the third is empty and open. The Butcher carries the Craglane Dog Cage Key that opens these cages. The second tunnel heading north-south leads into the pit where there is the body of the dead wolf. Between the two tunnels are more barrels and sacks with a set of clothes on top and a pair of boots on the ground beside them. Reading the small note, which can be randomly found on a dead bandit surrounded by wolves, will mark this location on your map. Just be warned, the butcher puts up a good fight and usually has an enchanted weapon. This could be a very long fight, come prepared. 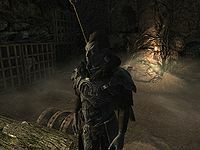 The first guard you meet inside Cragslane Cavern has no name, cannot be pickpocketed or looted after he has been killed. This bug was introduced in Patch 1.9. Esta página foi modificada pela última vez à(s) 05h38min de 15 de fevereiro de 2015.